A great event is well defined by its character and atmosphere. 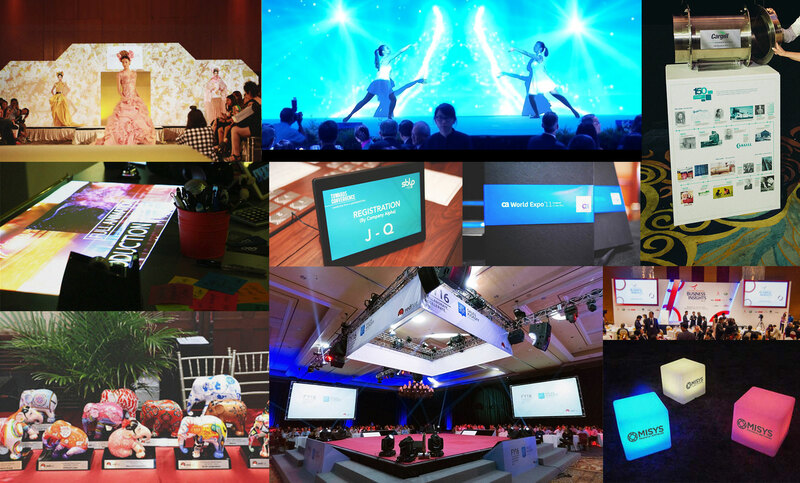 We specialize in the conception and production of engaging and immersive environment set ups, designed to suit your needs and deliver remarkable experiences for your audience. Our 2D/3D works encompass a myriad of collaterals, prints and installations to capture the essence of the client's brand and messaging. In line with our client’s CI, we keep abreast of market trends to ensure our designs are fresh and current. For a booth to stand out in a crowded trade event, it has to be creative in design yet functional while optimizing the space that’s available. We experiment with shapes, materials and visual displays to attract visitors and facilitate interaction between exhibitors and their target audience. Innovation is always at the center of our creative work. Our stage designs incorporate the use of projection mapping with motion graphics and videos to bring more perspective, movement and dynamism to an otherwise static backdrop.